For people playing the season opener, MIKE GUI will collect & log cash entry fees on behalf of Brian Miller (Brian will continue administering the tournament, but cannot attend the opener). First place: 75% of the total cash pot. Second place: 25% of the total cash pot. o ALL players will receive 10 points for participating. o Round 1 winners will receive an additional 15 points. o Round 2 winners will receive 15 points. o Advancing to Round 3 is worth 20 points. o Advancing to the final in Round 5 (the finals) is worth 65 points. o The winner of the final is awarded 100 additional Dragon’s point. (NEW) As a result of these changes, it is estimated the winner will therefore receive 250 to 260 total points, whereas the runner up will receive 150 to 160 total points (depending on 1st round byes). by the date of first tournament of the year. participate but are not able to make the season opener on April 20 th . Players can either pay Mike at the opener or Brian via PayPal. Similar to the 2017 tournament, there will be four bracket sections. Two A flight brackets, and two B flight brackets. Similar to 2017, the ‘final four’ will pit a winner from A flight and a winner from B flight on one side of the bracket, and the winner from the other A flight bracket against the other B flight bracket on the other side of the bracket. A blended combination of handicap, scoring at the opener, 2017 Dragon’s cup standing, geography, and general club participation will be used to determine the seeding for the brackets. (NEW) Performance in the opener will be weighted more heavily (but not entirely) for 2018 than from 2017. In other words, participants who did not play the opening tournament will be seeded appropriately, within their designated flight. Seeding will allow those with the better seed (lower numerical number) to determine the course for the upcoming match. So for example, in a match between the #1 seeded player vs. #8 seeded player, the #1 seed gets to select the course for the match. (NEW & IMPORTANT) In 2017, the higher seed (lower numerical seed) also got to select the tee set the match was to be played from, with the course handicap adjusted accordingly. In a mixed gender match (e.g., a male vs. a female), each player had their choice of tee set, determined before tee off, with course handicaps adjusted accordingly. This rule is no longer in effect. The ‘better seed’ will still select the course. (NOT NEW BUT OFTEN NOT READ) In instances where each competitor chooses to play from different tees (e.g., Red vs. White, Red vs. Blue, Blue vs. White), proper stroke adjustments are made using the USGA handicap calculator that factors the difficulty of the course from the players chosen tee set. Blue vs. Red tees often adjust very differently! (REMARKS): We believe the fairest system allows the better seed to choose the course, and each competitor to choose the tees they play, with course handicap adjusted accordingly based on the tees each player selects. Finally, while the initial brackets will be determined based on handicaps ‘as of’ the opener, the remaining matches will be played using the players handicaps the day of the match. Participants will schedule and play their matches on their own, rather than being paired at club monthly tournaments to the extent possible (with preference, as always, to the ‘better seed’). be completed by June 21 st (the Merced event), etc. These deadlines will be communicated at club events and via email, with at least 30 days allotted between deadlines. These deadlines may be adjusted at the discretion of the match play chairperson. (NOTE) The timing is accelerated this year because of a relatively condensed 2018 Dragon’s calendar. For any match that fails to be completed (or scheduled) by the deadline, we will randomly select the “winner” (by coin flip) to advance to the next round. We encourage everyone to all exhibit courtesy and flexibility in scheduling your matches with your fellow members — and if you need any assistance in scheduling, please let the chairperson know. (EPIC DUALS!) After you complete your match, please send an email to Brian Miller (onafriday@hotmail.com) with the result/score of the match as well as highlights of the round. Please copy dgc@dragonsgolfclub.com on the email update. 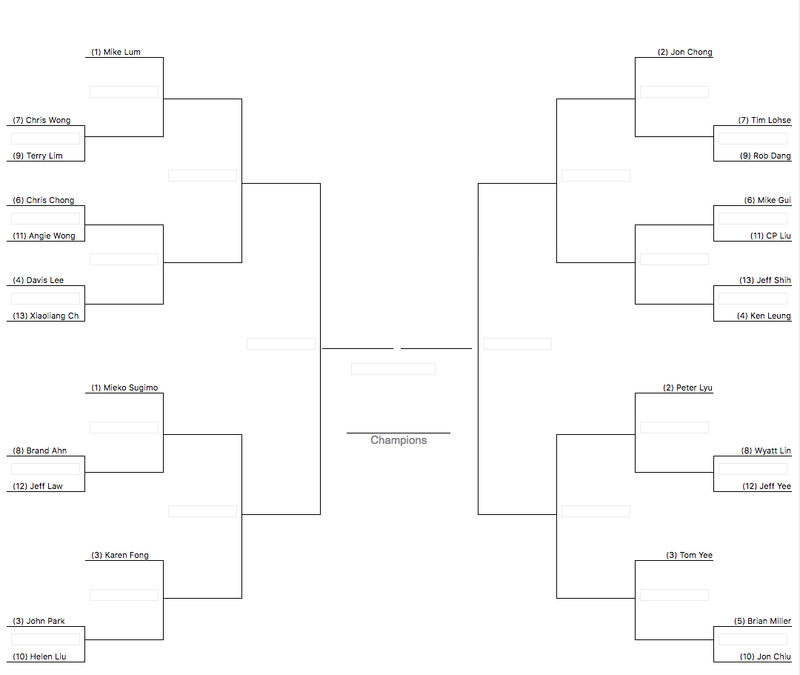 Regular bracket updates will be included in the newsletter and shared at Dragon’s events. The winner will be honored at the end of the season Awards Banquet. (NO REALLY, READ THE TEE AND HANDICAP RULES) See updated tee set rules above. Players should use the net handicap difference to determine the number of strokes awarded to the lower seed. For example, if player A has course handicap of 13 from their chosen tee, and player B has course handicap of 9 from their chosen tee, the net difference is 4. Player A should get one stroke compensation for holes ranked handicap #1 thru handicap #4 (SEE EXAMPLE BELOW). Player B would not get any strokes. Strokes are awarded on the handicap holes in line with the score care of the player ‘getting strokes’. (SEE EXAMPLE BELOW). Very often ‘Blue’ tees handicap 1 is different than ‘Red’ tees handicap 1. The recommended tie breaker for Match Play is to play additional holes until a winner is determined, where practical. Since there is ordinarily no chance to play additional holes, we have opted for using a card off method. In this method, the net winner of the #1 handicap hole of the player receiving strokes wins the match. Where there is a draw on the #1 handicap hole, the card off proceeds to the net result on the #2 handicap hole, etc., until a winner is identified via card off. (DO YOURSELF A FAVOR!) In other words, that match #1 handicap hole may as well be worth 1.5, because in a tie scenario, this one tips the match. Smart competitors will strategically play that #1 hole! Karen has read the club rules and understands she can elect to play from the red tees, and has chosen to do so. Her course handicap is based on 73.2/123. Brian is playing the white tees, and his course handicap is based on 71.1 / 122. Note, had Brian chosen to also play the red tees, his course handicap would be based on 68.7/116. This would result in Brian and Karen’s match looking very different in terms of shots given. Brian and Karen are having a match where the course adjusted handicap results in an adjusted difference of 4 shots. Karen is therefore getting 4 shots. Karen gets the four shots on holes 2, 4, 10 and 18. Please note that these are the four hardest holes from the course set up she is playing. Note how handicap holes 2 and 4 are different on the white and red card. If Karen gave Brian shots, this match would be very different! At the end of 18, the match is tied. The card off is determined based the net score (regardless of par) on hole 4, and then, if necessary, 10, then 2, then 18, etc. In the example above, if there is still a tie after four card off holes, the next determining holes would be 8, 13, 9, etc. — based on Karen’s ‘course setup’, as she was getting strokes in the match, regardless of Brian’s ‘course setup’. Note that Karen may have a match against Lawrence in round two, and may GIVE Lawrence shots based on handicap. In this case, the stroke assignments and card off would be based on Lawrence’s card, rather than Karen’s.